The Annual Percentage Rate (APR) is the yearly rate of interest that an individual must pay on a loanLoanA loan is a sum of money that one or more individuals or companies borrow from banks or other financial institutions so as to financially manage planned or unplanned events. In doing so, the borrower incurs a debt, which he has to pay back with interest and within a given period of time., or that they receive on a deposit account. 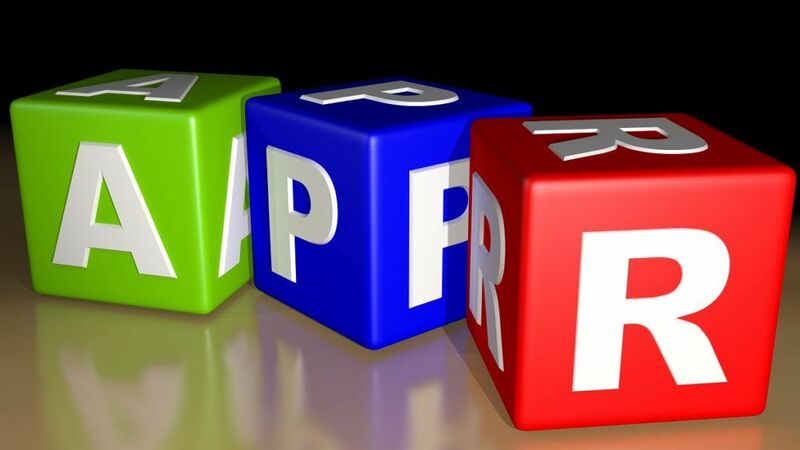 APR is used on everything from mortgagesMortgageA mortgage is a loan – provided by a mortgage lender or a bank – that enables an individual to purchase a home. While it’s possible to take out loans to cover the entire cost of a home, it’s more common to secure a loan for about 80% of the home’s value. and car loans to credit cards. Ultimately, APR is the simple percentage term used to express the numerical amount paid by an individual or entity yearly for the privilege of borrowing money. Every time an individual borrows money in a traditional loan sense (think borrowing to purchase a house, car, or other major financial expense), there is a cost for the privilege of borrowing money, known as interest. The annual percentage rate is the percentage of interest the individual must pay on the loan, which ultimately adds up to the total cost of the loan. Let’s consider an example to explain the concept further. An individual takes out a $25,000 loan to buy a car. The loan comes with a fixed APR of 5% and must be paid back over the course of five years. This means that the individual will need to make regular monthly payments of around $471. However, the monthly payment is used toward paying back both the principal loan amountPrincipal PaymentA principal payment is a payment towards the total principal amount of a loan that is owed. In other words, a principal payment is a payment made on a loan that reduces the remaining loan amount due. and the interest due on the loan. The monthly payment amount remains the same, but the breakdown (or what percentage of the amount goes toward the principal and what percentage goes toward the interest) changes as more payments are made. As the individual progresses through the payments over the course of five years, the yearly amount paid in interest changes. In our example, the individual begins by paying $1,500 per year in interest, but the amount will change after another year of payments. In the end, the individual ends up paying $28,306.88 total: repayment of the principal of the $25,000 loan and $3,306.88 in interest. In the example above, the 5% annual percentage rate was fixed. It means that the APR remains constant throughout the entire term of the loan. Fixed APRs can change. They’re not tied to any index, and the change isn’t automatic. A lender is required to give advance notice to the borrower if the APR is going to change. The lender has the prerogative to adjust the annual percentage rate to better suit market changes or if the borrower fails to make payments on time, but they must let the borrower know that changes are going to occur and why. Fixed APRs are most common with credit card “loans” or borrowing and is often used as an introductory interest rate before being switched to a variable APR. Variable APR, then, means just the opposite of fixed APR. Variable APRs are inconsistent and fluctuate – sometimes considerably. In the US, variable APRs are typically tied to the prime rate index, meaning as the prime interest rate changes, the APR will change. The prime rate index is set to match the Federal funds rate established by the Federal ReserveFederal Reserve (the Fed)The Federal Reserve, more commonly referred to The Fed, is the central bank of the United States of America and is hence the supreme financial authority behind the world’s largest free market economy.. This means that any time the Federal government adjusts interest rates throughout the country, variable APRs will change accordingly. Individuals or businesses are not always on the paying end of the APR. When an individual or business maintains a deposit account at a financial institution, they can earn interest on their deposits. The bank or other financial institution pays the account holder interest because the bank is essentially borrowing the account holder’s money. In this scenario, the account holder will receive the quoted APR for the deposit account. Note that lending institutions always offer an APR on deposit accounts that is significantly lower than the APR they charge for loans. This is part of how banks make money. They “borrow” deposit account money at a low interest rate, and then loan the money out at a higher interest rate. It’s important for any individual who borrows money to understand the rate and terms of their APR, including whether it’s fixed or variable. This enables the borrower to establish a budget, use their loan wisely, and make consistent payments toward both the principal loan balance and the interest for the privilege of borrowing money. Inconsistent or failed payments can make a significant difference in the total amount of interest paid over the life of the loan. PrepaymentPrepaymentA Prepayment is any payment that is made before its official due date. Prepayments may be made for goods and services or towards the settlement of debt. They can be categorized into two groups: Complete Prepayments and Partial Prepayments.